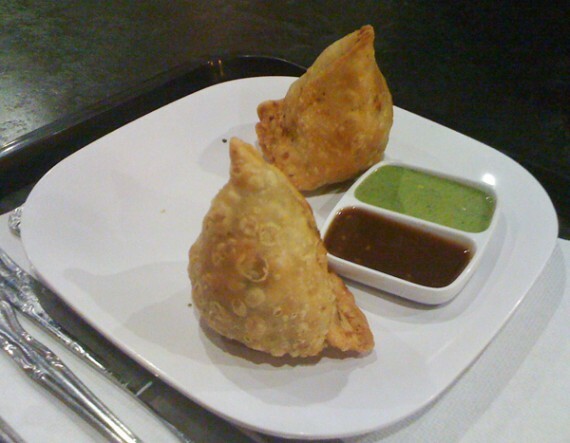 We started with Samosas….perfectly crispy with a tasty potato/pea/spice filling. 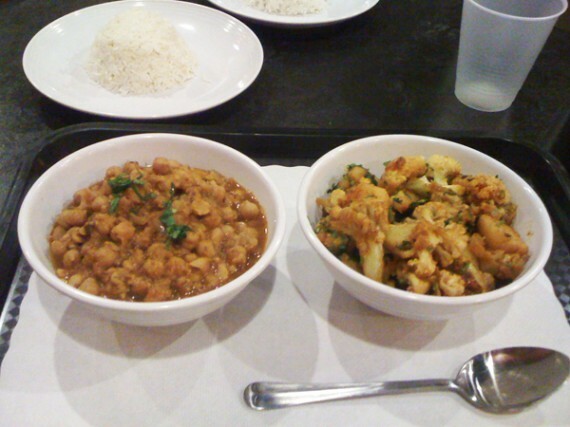 Then we got Gobi Aloo – everyone’s favorite Cauliflower/Potato dish, Channa Masala – curried chickpeas, and Korma Curry with Jackfruit. They also have mock-meats, which is a first for me at an Indian place….they have mock shrimp, chicken, and fish…but jackfruit sounded really interesting….and it was excellent! It’s sort of like an artichoke heart, but “stringy” like meat. I forgot to ask if the mock-meats were vegan…sorry! I’m sure one of us will find out soon. [side note from QG: i called the restaurant, and they told me that all of their fake meats ARE VEGAN! woo!] Anyway, all the food was great so far – spicy and flavorful without being overly oily, which I really appreciated. One thing that keeps me from going for Indian a lot is the oil….but this place really goes easy on it, and just let the sauces and flavors stand on their own without weighing you down. 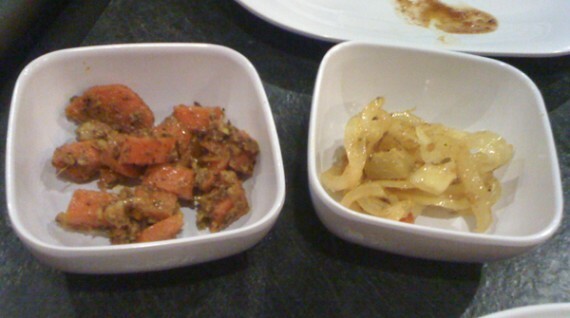 While we were eating, the owners brought us some Indian pickles (carrots and onions), and vegan roti bread! To be honest, the onion pickles weren’t for me….but the carrots were really nice. Then came the DOSA!!!! Holy crap, it was HUUUUUUGE!!!! It came with dipping sauce and coconut chutney. It was fantastic…everything my dosa loving self had dreamed of. 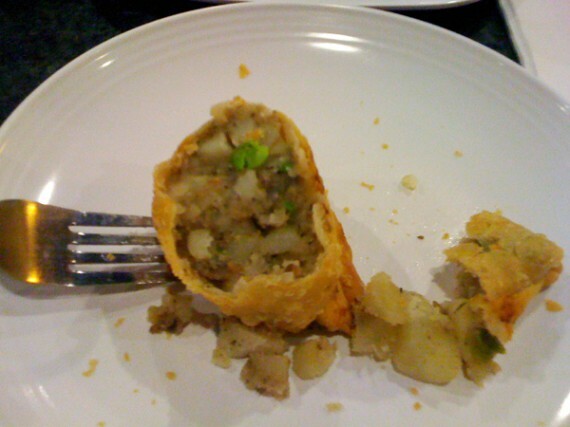 Lots of flavorful potato and spice filling, that perfect flakey crispness….and again, like the other food, very light on the oil. 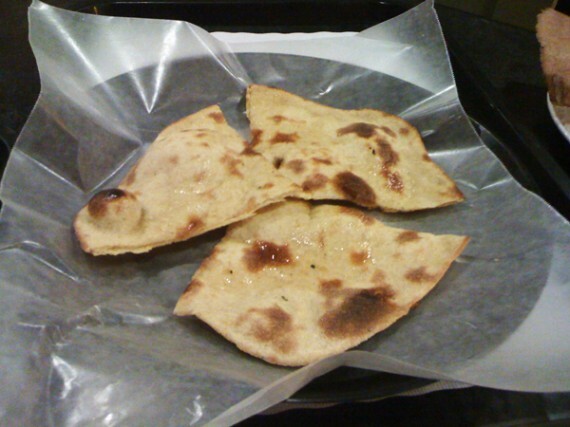 Dosa at other places sometimes gets soggy really quickly due to the oil content….not here. They use just enough to get it crisp. 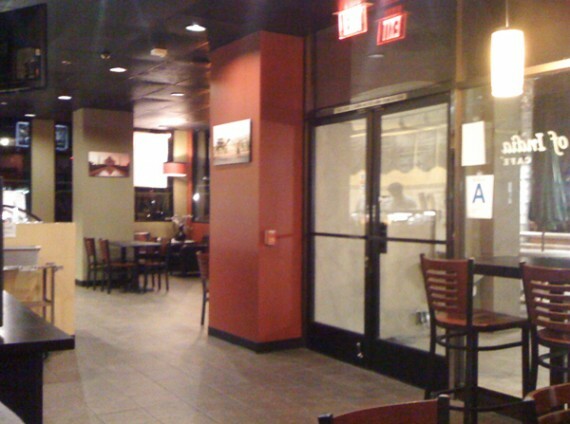 So there ya go – I love this new place…another great vegan joint in the valley!!! I plan on going there often for dosa! I hope you guys get a chance to eat there….enjoy! How interesting that they call themselves a vegetarian restaurant when, according to their website, some of their dishes can be ordered with lamb or chicken…. Oops! I guess the ‘lamb’ and ‘chicken’ are FAKE meats. Wish they would specify that on the menu, though. One thing I really like about Gate of India here in Hollywood is that they offer Saag TOFU. To Fritz, when you print out the pdf version of the menu, there is a note at the bottom that says chicken, fish, lamb and shrimp are made of Soya products. This place sounds yummy. Almost an excuse to go to the valley. Thanks, Debbie. Glad to hear it’s mentioned THERE, at least. Finding good Pakistani food is always a blessing! If it’s anything like the UK most restaurants are run and cooked by Pakistani’s, yet call themselves “Indian”! Funny old world innit. Yes! This place is close enough to my work to be able to grab lunch! Thanks for posting my review QG! 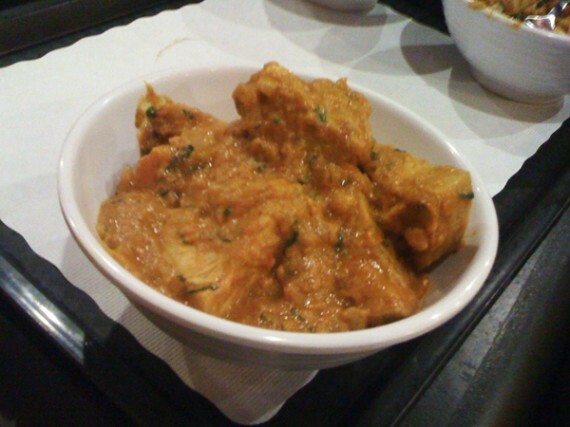 I went again last night….I tried the Tika Masala and Korma Curry with the vegan chicken. They’re using the same vegan chicken that Wheel of Life in Irvine uses, which is one of my favorites!!! I also got the Mysoor Dosa, which is a spicy version of Masala Dosa….Mushroom Matar, and the “Lamb” Samosa. All amazing and delicious. Everything looks delcious! Here in Silverlake, all Vegan Indian Restauarants is sparse. Parus is on the expensive side, and the food at that Indian Market on Los Feliz is well.. unedible. Cheap and tasted like it. Thanks for the review, it all looks delicious!! Love the Dosas too!! We finally made it to “NY Dosas” Cart in NY. All vegan, super yummy dosas for 6 bucks. Wish we had that in the midwest!! And most of them are gluten free as well. Love your blog! It really helped when we went on our LA trip. i really appreciate this post–thank you! as a valley dweller, i’m always excited to learn about all of my vegan options and this place is a new favorite! so delicious and very affordable. the owner is very kind and will spend time educating you on all of the dishes. for the most part, the menu is entirely vegan and the few items with milk can be replaced with coconut milk. and he knew all about QG too! The owner is SUPER NICE…almost too nice, if that’s possible!!! There was a couple eating at the table next to me and my friends….the owner brought them an extra dosa, because the chef didn’t think the first one came out good enough and wanted to re-do it…heh. Streets of India is probably good, but the real deal is at WOODLANDS INDIAN CUISINE in Chatsworth. It’s Southern, their Dosa’s and Paratha rule, and they have an amazing buffet Tues-Sat during the day and Wed at night(ala carte is good, too, but you definitely need the buffet). It is 100% vegetarian (not sure if it’s vegan, sometimes they have paneer) and is THE BEST INDIAN FOOD in LA! It’s crazy you haven’t reviewed this place yet considering it’s been there for years and is one of the only all-vegetarian Indian places in Los Angeles(you can definitely skip Paru’s). Agreed Greg.Makes sense .Was at SOIC & you are right ,food is very light & refereshing.Okra tastes like Okra & Chana masala tastes just like that.Staff told me they are starting an eve South Indian Buffet.That should be exciting.They have added Idli to their Menu which is very healthy,made from steam rice. Went here today and the jackfruit curry was INCREDIBLE! Huge thanks to Greg for the find and for the pictures of the dishes. 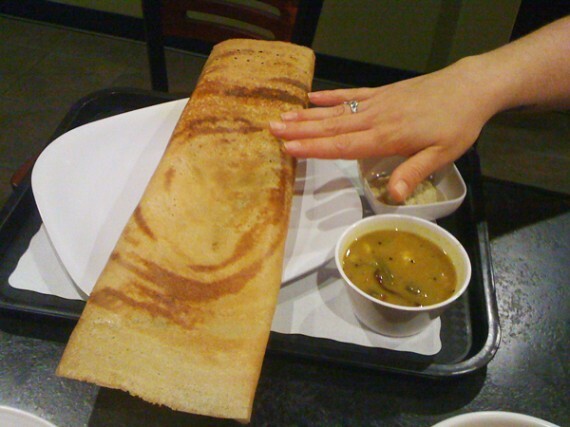 I’ve never had Dosa before, but I will get it next time based on this review. The staff were very friendly as well. I will be back. Today had their Idli,Vada Sambhar & Upma.Was light & refreshing.Idli was done just right & the sambhar was delicious.Taking my cousins there for the weekend lunch. This place is underrated. I keep coming back because the food is amazing and the lunch price is VERY reasonable. Thank you Streets of India Cafe for being part of the delicious Season 2 of “United Tastes of America.” Keep your eyes open for our premiere – Tuesday, July 12 @ 10pm! Be sure to check the Cooking Channel website for updates. This place is an excellent find especially for those of us who live in the valley. I’ve probably been to Streets of India 5 times this week. If I could eat there everyday, I would! Love this place, man oh man. Tried their “all you can eat” lunch buffet for $8,cheapest in the valley.Now they are letting the customers serve themselves what ever they want.It’ an open buffet. Did see some real chicken which they have added due to demand from the nearby office crowd. Still a good value for the money. I freakin’ LOVE this restaurant with all my heart . Try the Bhelpuri as an appetizer the next time you go. It’s soooo good. I have made my way through a lot of the menu now, and I haven’t had a bad dish yet — nor do I expect to. This place is a gem. It’s vegan/vegetarian friendly AND DELICIOUS!!!! I was in Encino and decided to try out their ‘all you can eat’ lunch buffet for 8.00. They had about 10 different vegan options, including my favorite, Ala Gobi (spelling?). The food is fresh, not greasy, not full of salt, very YUMMY and the owner is very sweet. She told me that the place used to be only vegan but she had to add meat dishes because business was not good…Hey, I’m glad she did what she had to do to stay open. I’m now a regular customer and I also like the fact that they are clean (they even wear hair nets). I’m a supporter of vegan friendly places and I highly recommend this restaurant to my fellow vegans! Again, lunch buffet is an AWESOME deal!